DualShockers presents their Game of the Year Awards for 2017, with Persona 5 taking the top spot for both readers' and staff members' picks. Welcome to 2018 at DualShockers, and let’s ring in the New Year with our most time-honored tradition: reflecting on the previous year’s game and trying our best to rank them. And what a year 2017 was. Continuing from the practice from previous years, our most important awards — Game of the Year (Readers’ Choice) and Most Anticipated Game of 2017 (Readers’ Choice) — are both voted by you, our readers. When it comes down to it, we are all a group of gamers chatting about the medium we love. More importantly, a notable thank you to the enthusiasm and excellent taste of everyone in the community. 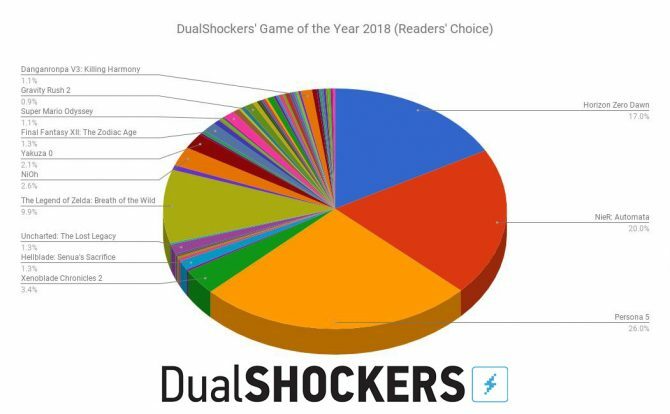 While last year’s Game of the Year selection was won by a landslide, this year we saw a lot more nuance to the choices. Not only did we see selections of the AAA games on major home consoles, but indie games, handheld games, and titles largely ignored by mainstream audiences. The selections for Most Anticipated Game of 2018 is even more diverse, spanning across every different system and genre. And when it comes down to it, there is nothing that we appreciate more than how varied our readership is. If you want to check out the rules of the popular vote, you can read them here; but without further ado, I leave you with the results. Last year, both our readers and our staff voted for the same game as the best of the year, and that perfect alignment happened for 2017 as well. This time around, though, we got a much closer verdict, with the runner-up hot on the heels of the winner. 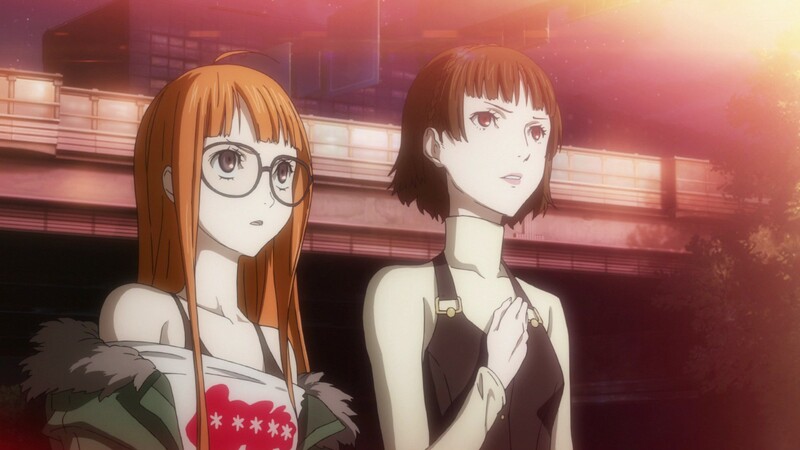 Atlus’ Persona 5 evidently managed to steal many hearts thanks to its lovely story, likable characters (who placed very well in our Best Waifu and Best Husbando vote as well), super-stylish art direction, fantastic music, and more. We stay in Japan for the runner-up as well. Yoko Taro led a veritable dream team on NieR: Automata, and created a game with undeniable qualities that received one-fifth of your votes. 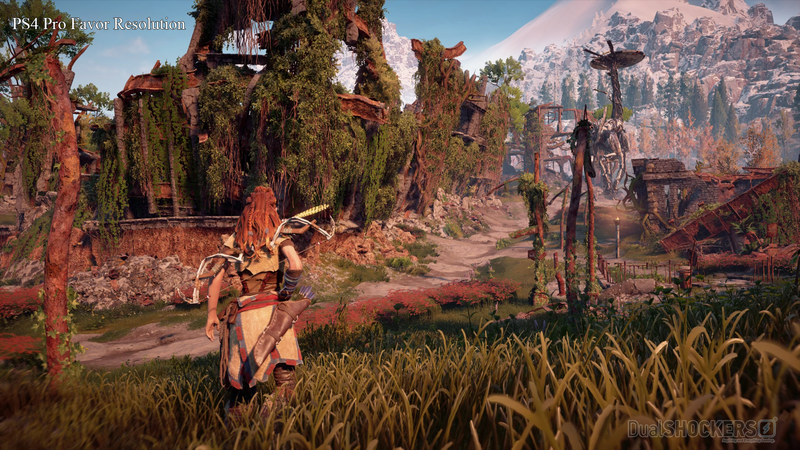 Guerrilla Games’ Horizon Zero Dawn well represents western game development and manages to snag a flattering third place, ahead of another open world game, Nintendo’s The Legend of Zelda: Breath of the Wild. Below you can see a pie chart with the vote split, and the indication of the games that received the most nods from our readers. 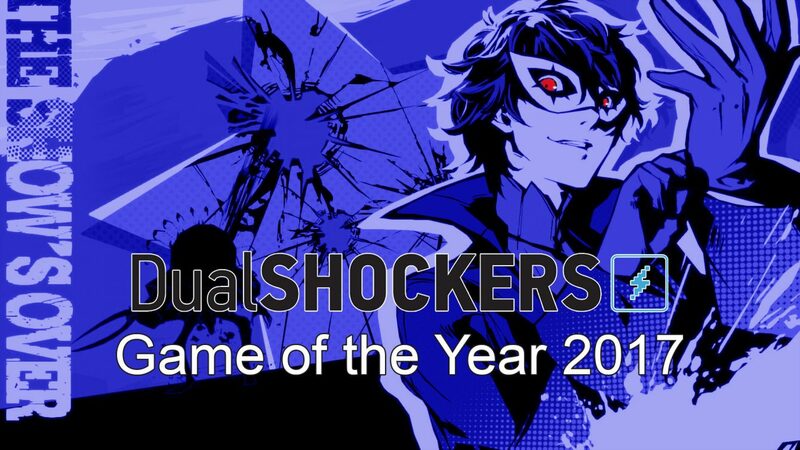 That being said, Persona 5 officially wins DualShockers’ top honor for 2017. 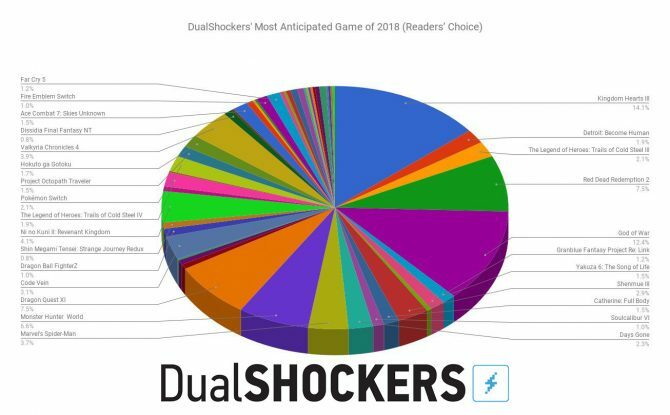 The vote for Most Anticipated Game of 2018 was a lot more closely fought than that for Game of the Year. No game title managed to push beyond 15% of your votes, and there are many more games that received a sizable percentage of nods. 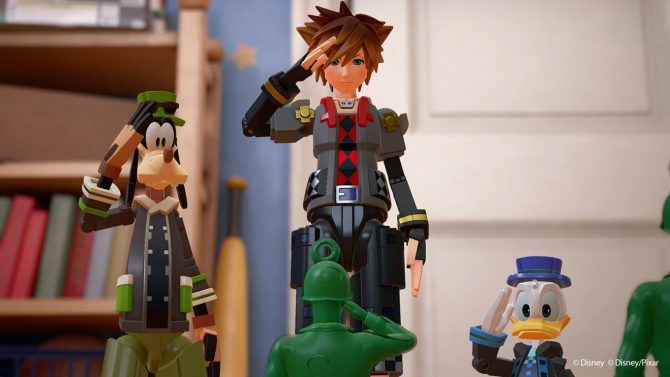 Yet, there can be only one winner, and the honor goes to Square Enix’s Kingdom Hearts III, that will finally come this year after a long wait and many decimals. Sony’s God of War also received many votes, placing second and showing that many of you can’t wait to enjoy the adventure of Kratos and his son Atreus. Square Enix’s Dragon Quest XI and Rockstar’s Red Dead Redemption 2 received exactly the same number of votes for an ex aequo third place, with Capcom’s Monster Hunter World just a few nods behind. Like last year, we can definitely say that we’re proud of our community. The diversity in development cultures and genres represented by your votes is fantastic, and it’s pleasing to see that you folks are excited about many so many games beyond the inevitable traditional AAA titles. 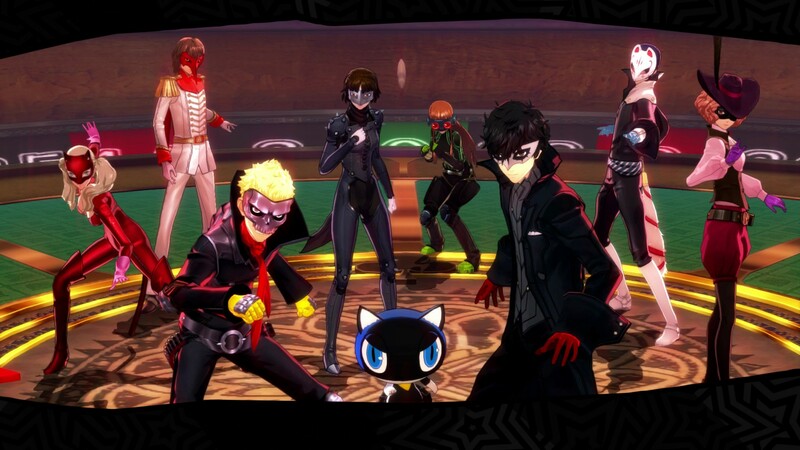 As the title says, Persona 5 was a game that came and stole our hearts. In a year that saw amazing releases — including The Legend of Zelda: Breath of the Wild, Horizon: Zero Dawn, NieR: Automata, and Super Mario Odyssey — it came up against some stiff competition. But at the end of the day, Atlus’ expertly told narrative, impeccable style, and lovable characters won the day. 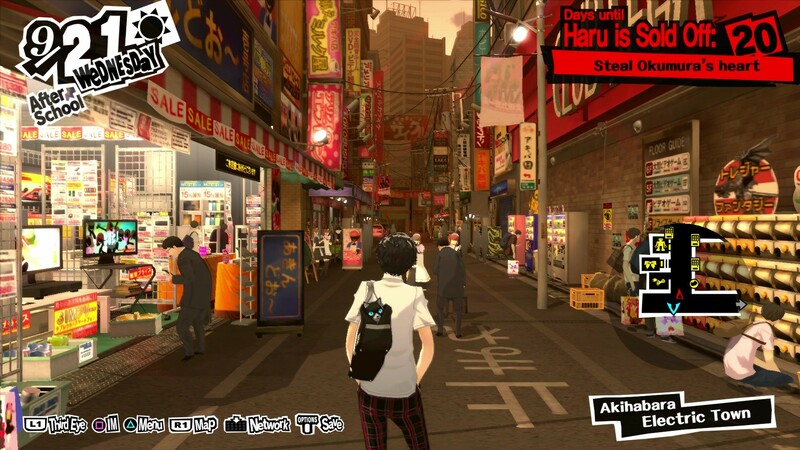 Even more impressive about Persona 5 than those components is how well an otherwise niche genre has been able to cut into mainstream gaming populations. Sure, Persona 4 started the wave of Western audience taking an interest in the series. But if Persona 4 was a wave, then Persona 5 acted as a tsunami — a constant source of praise from game creators, critics, and gamers alike. Thankfully, our readers agree with our opinion on this one. 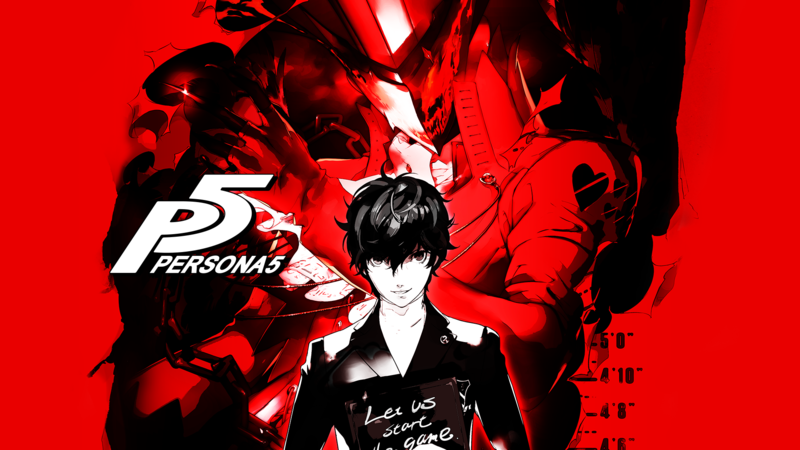 If you want to read more about the game, you can check out DualShockers’ review of Persona 5. 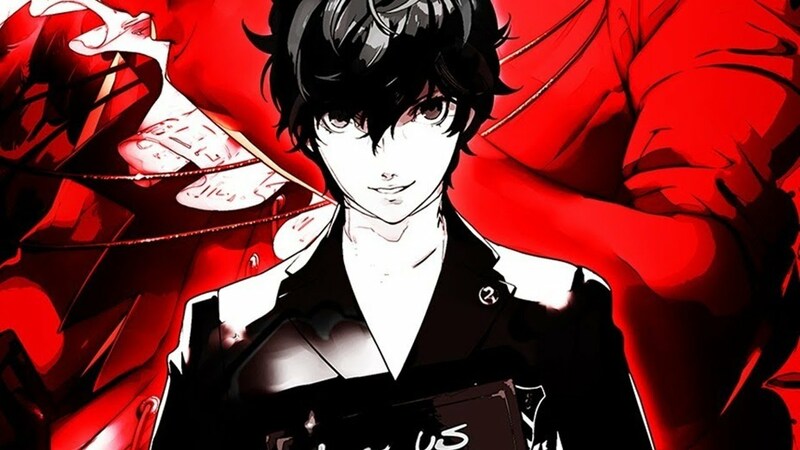 On top of Game of the Year, Persona 5 has also won Best PS4 Game, Best Role-Playing Game, Best Narrative, and Best Soundtrack. As compared to Game of the Year, the Most Anticipated Game of 2018 category was much more contentious among the staff. Point being, our interests are so varied that is was hard to pick just one series or property. But what we could all agree on is the craftsmanship and expertise of developer Rockstar Game. 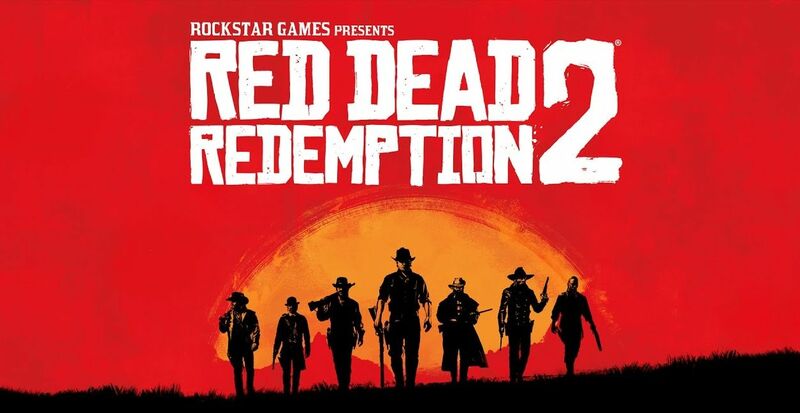 With this in mind, Red Dead Redemption brings home the prize as the staff’s most anticipated 2018 game. When the Nintendo Switch was first released, DualShockers was one of the most ardent critics of the system. While everything about it felt right, it was hard to recommend a system that relied so much on potential. Thankfully, Nintendo spent the year proving that point, dazzling critics and gamers alike with month-after-month of AAA exclusive or phenomenal indie title. 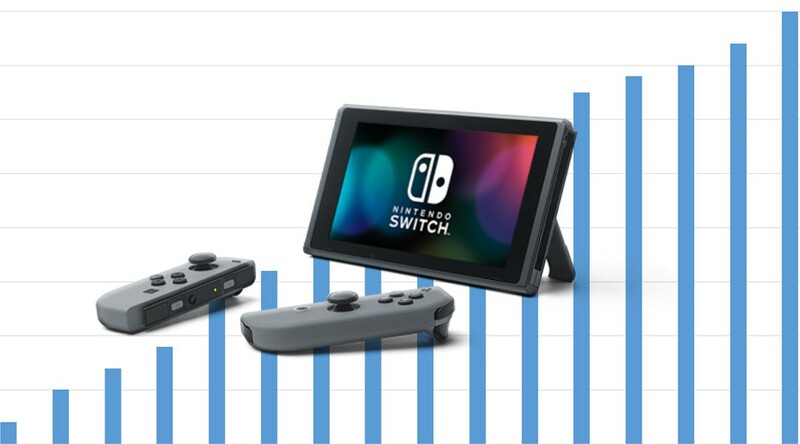 In turn, the success has driven sales — Nintendo Switch remains one of the hottest items of 2017, and it doesn’t look to be slowing anytime soon. 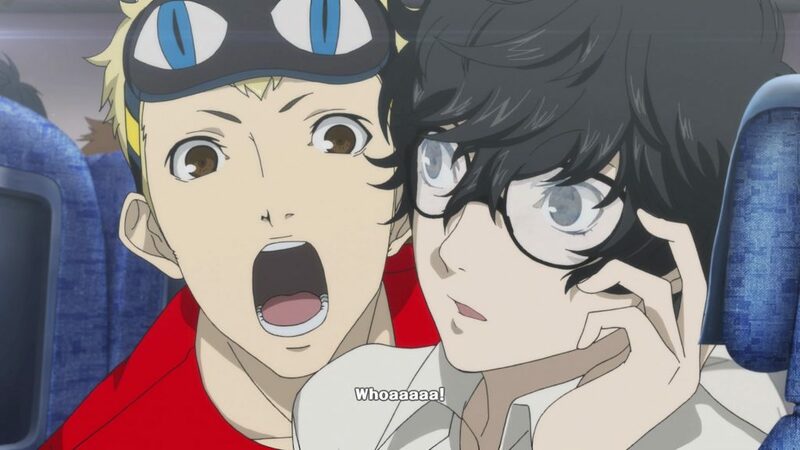 While we all agreed that Persona 5 was DualShockers game of they, both Super Mario Odyssey and runner-up The Legend of Zelda: Breath of the Wild followed close behind. 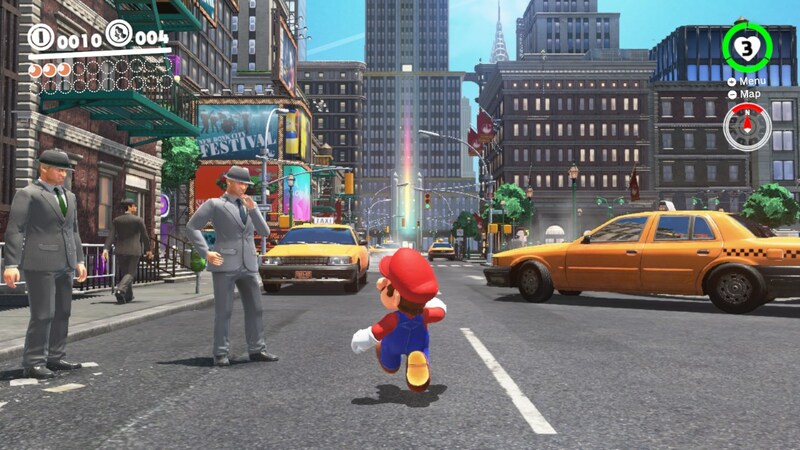 Super Mario Odyessey presented a return to 3D Mario in a refreshing way. 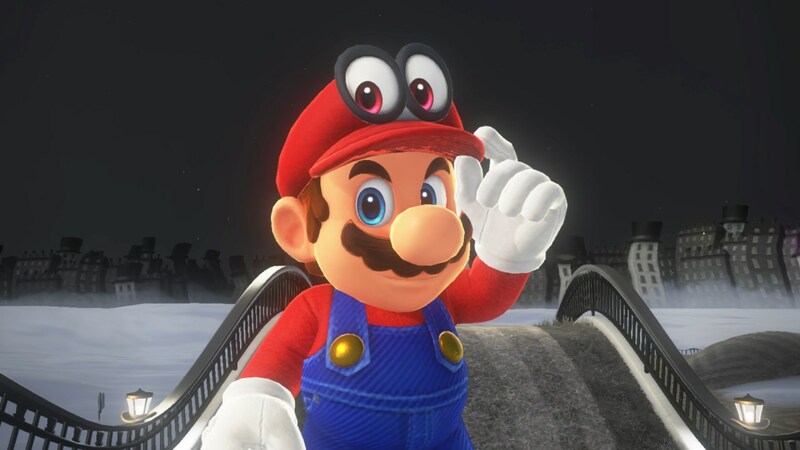 Adding in Cappy, the magical hat-like being that let’s you plays as the many enemies of the Mario universe — broadening up gameplay, world design, and puzzles in ways we have not witnessed in the series to date. Super Mario Odyssey also brings home the awards for Best Nintendo Switch Game, Best Family Game, and Best Level or World Design. For more information, check out DualShockers’ review of the game. 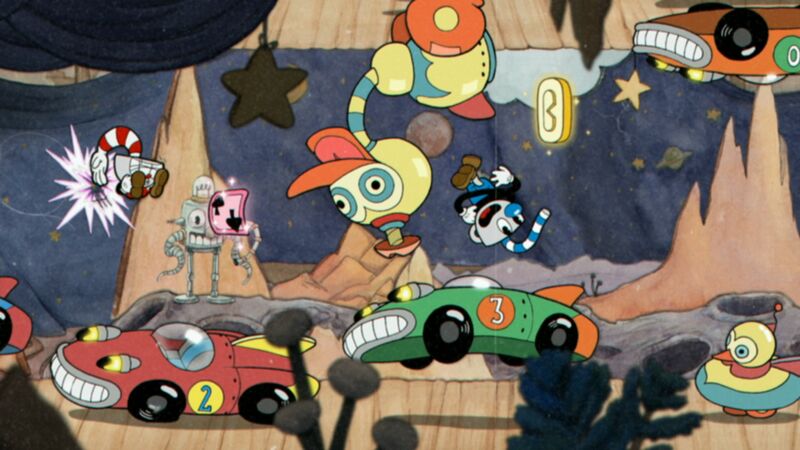 The term “indie darling” was created for games like Cuphead. 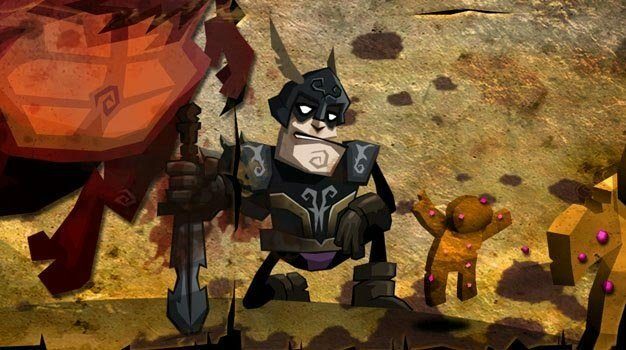 The game stole our hearts with its art design when it was revealed many years ago, but what most impressed us after release was the level of detail, consistency of game design, and how much impact the game had on the gaming community at large. On top of this award, Cuphead takes home a ton of awards, including Best Xbox One Game, Best PC Game, Best Platformer or Puzzle-Platformer, and Best Art Direction. 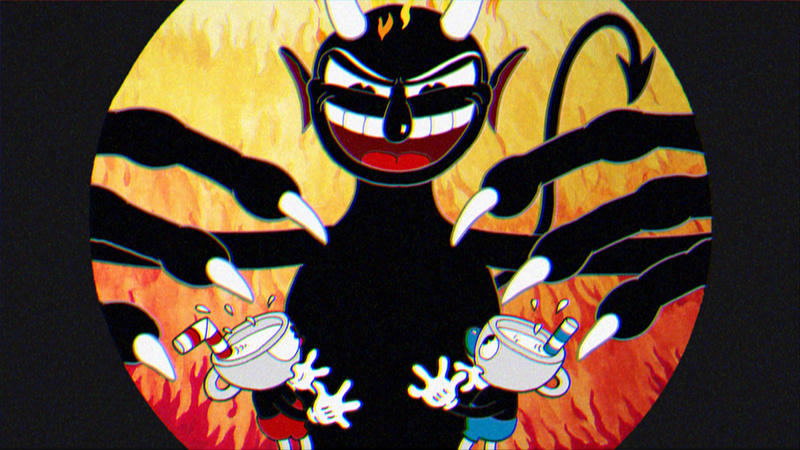 For more information, check out DualShockers’ review of Cuphead. 2017 is very much the year of PlayerUnknown’s Battlegrounds. With the Battle Royale title seemingly smashing records on a weekly basis, there have been few games more covered (and often criticized in 2017). 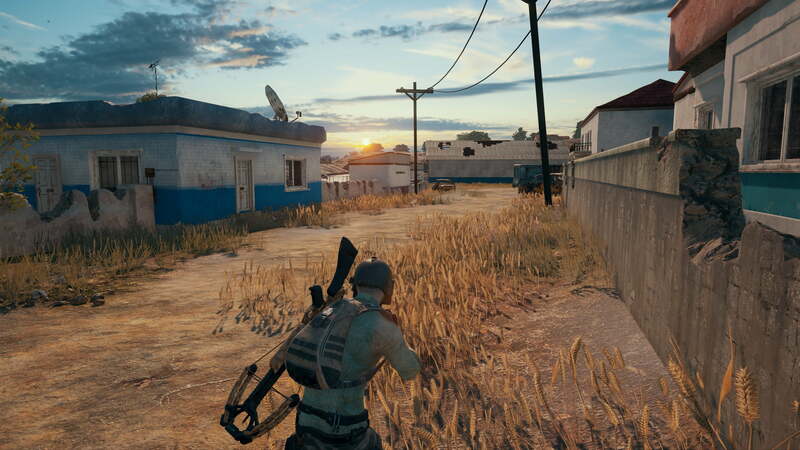 However, with many games already trying their best to copy and transform what makes PUBG so great, it is a title that will likely have a lasting impact to game development far outside of just this year. For more information on PlayerUnknown’s Battlegrounds, you can check out DualShockers review. For all intents and purposes, Studio MDHR seemed like the biggest underdog vying for this award. As an organization, they are relative newcomers to the gaming scene. 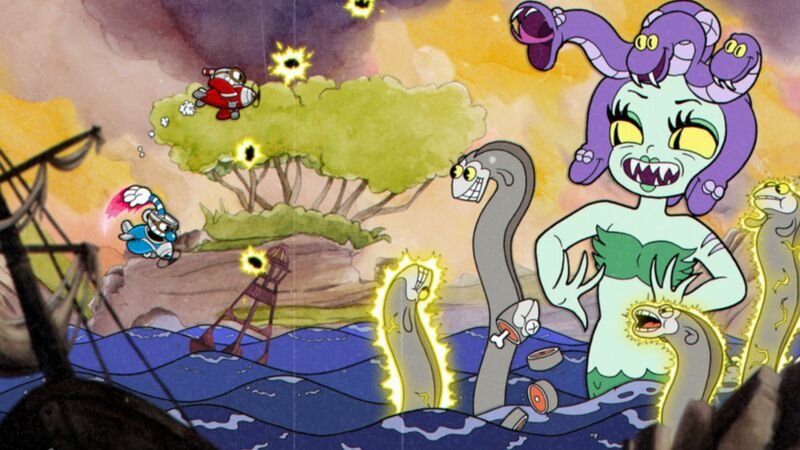 Cuphead was often criticized leading up to release for its long development time and uncompromising difficulty. And this was the year of many amazing releases that tested the boundaries of gaming. 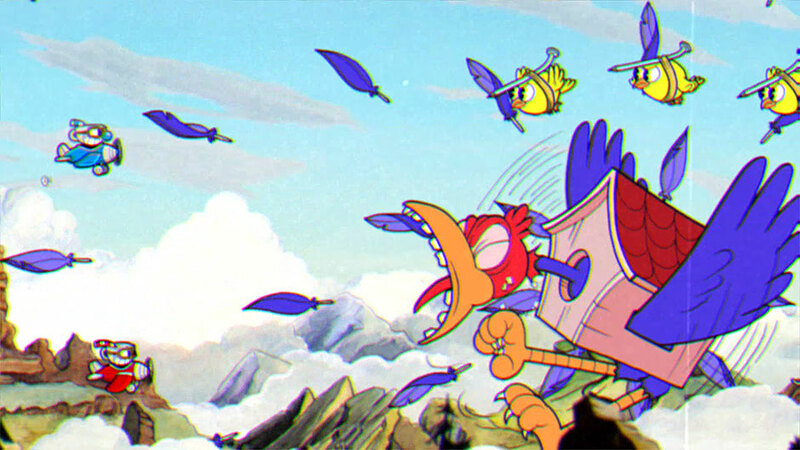 However, Studio MDHR defied expectations with Cuphead — a game that showed an almost reverential dedication to game design, art direction, soundtrack, character design, and everything in-between. As such, we think it is only right to laud the studio for excellence in those areas, hoping other details take on the attention to detail Studio MDHR brings to the table. 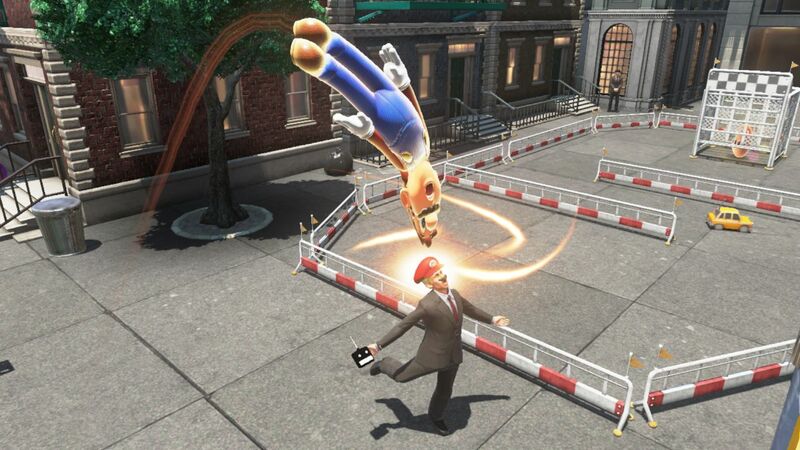 By all accounts, Nintendo smashed expectations this year in more ways than one. Outside the success of the Nintendo Switch, the individual software that Nintendo developed or published have often been unrivaled. Between The Legend of Zelda: Breath of the Wild, Super Mario Odyssey, Splatoon 2, Xenoblade Chronicles 2, and a new set of Pokémon games, it should come as no surprise why Nintendo was the studio to beat last year. 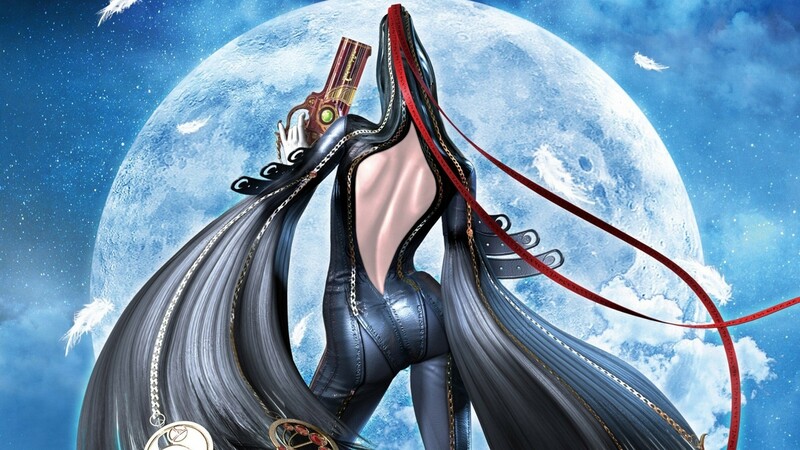 Our Best Announcement category serves to award the game announcement that wowed us the most this year, and — to no surprise — we were over the moon about Bayonetta making a re-appearance on Nintendo platforms. Even better, we weren’t graced with just one game. Instead, gamers will be getting the new Bayonetta 3 as well as ports of the original two games for anyone who has missed the series. Coming as a relatively late The Game Awards announcement, this was quite a way to end 2017 with a bang. Runner-up: There’s a baby living in Norman Reedus’ throat. Biggest Shocker!!! is one of our favorite categories, showing off an industry trend, announcement, or mishap. This year, we award that to Nintendo for its breakthrough performance in 2017. Why was this such a big shock to staff? Anyone who has followed the industry for the last five years could tell you that Nintendo was not in the highlight of their career. Following the Nintendo Wii’s blue ocean market strategy, many mainstream audiences failed to attach to late-in-life system hardware or even the Wii’s successor — the Wii U. 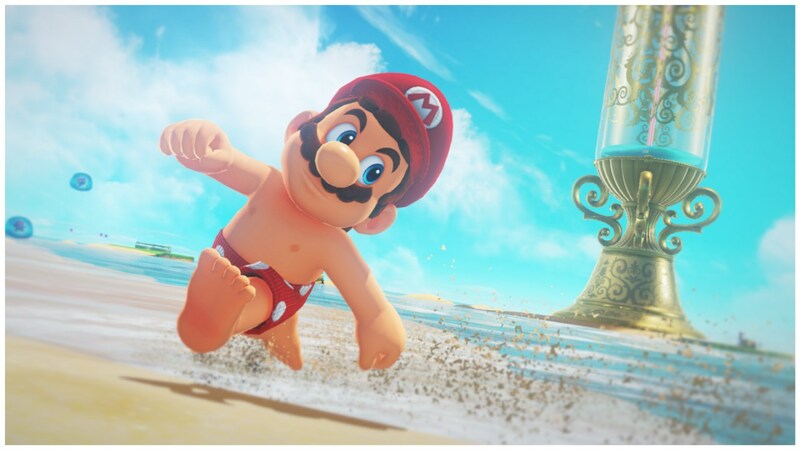 Almost like magic, Nintendo started 2017 strong with a different market focus on core gamers, shifting their brand to be less kid-oriented and more gaming-oriented. And that move has paid off, with the Nintendo Switch selling gangbusters and one of the best game lineups for any first-year system. Though the PlayStation Vita is still defying all expectations in 2017, no game was better suited for the system or better received than Danganronpa V3: Killing Harmony. 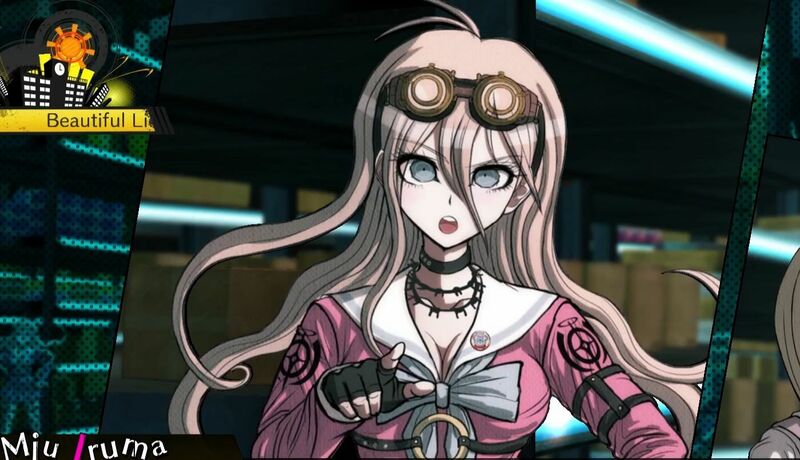 By all means and measures, developer Spike Chunsoft hit some new highs with this visual novel, adding gameplay diversity and a story that is still able to wow gamers. For more information, you can check out the DualShockers review of Danganronpa V3: Killing Harmony. 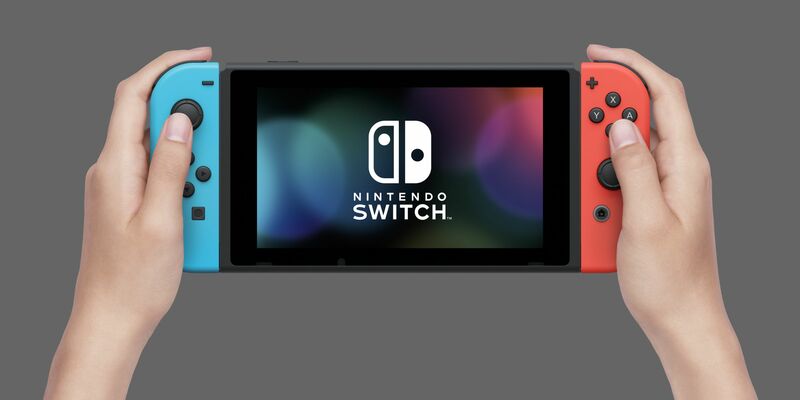 The mobile market is another success for Nintendo, who took to that market late-in-life as compared to other developers. 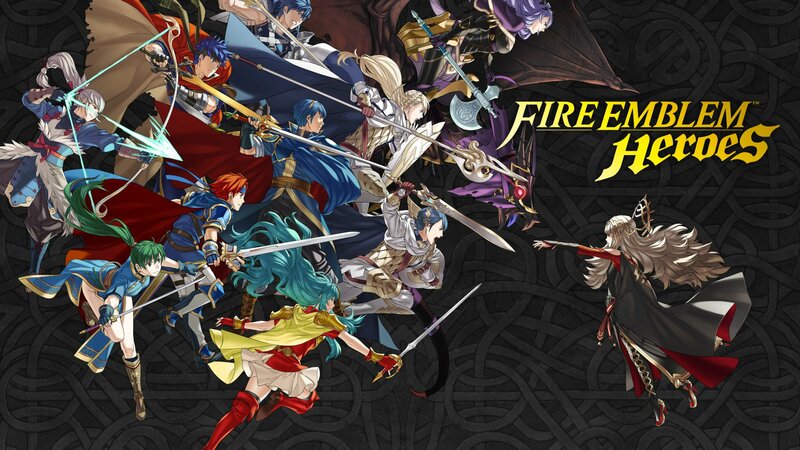 And when compared to Super Mario RUN or Pokémon GO, Fire Emblem Heroes is a continued financial success, thanks to a bolstering community and gameplay more fit for mobile devices. Despite claims of formulaic story and gameplay, never has The Legend of Zelda series had such a stand out year. 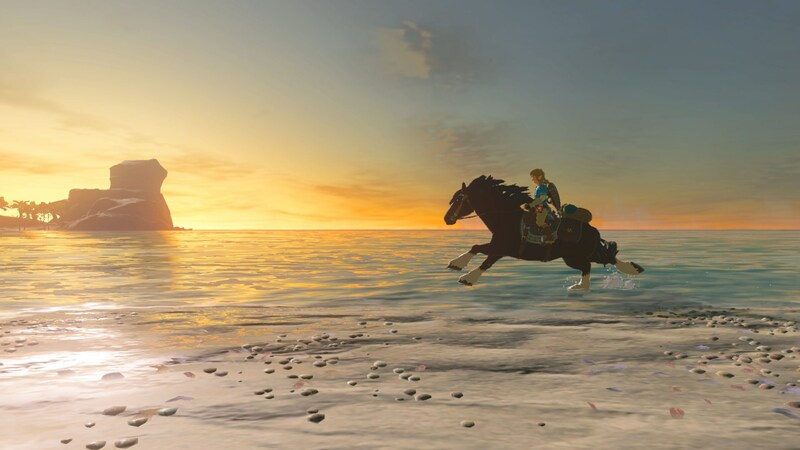 Acting as the most notable Nintendo Switch launch game, The Legend of Zelda: Breath of the Wild toyed with both minimalist storytelling, open world design, and game mechanics in a mystifying fashion. 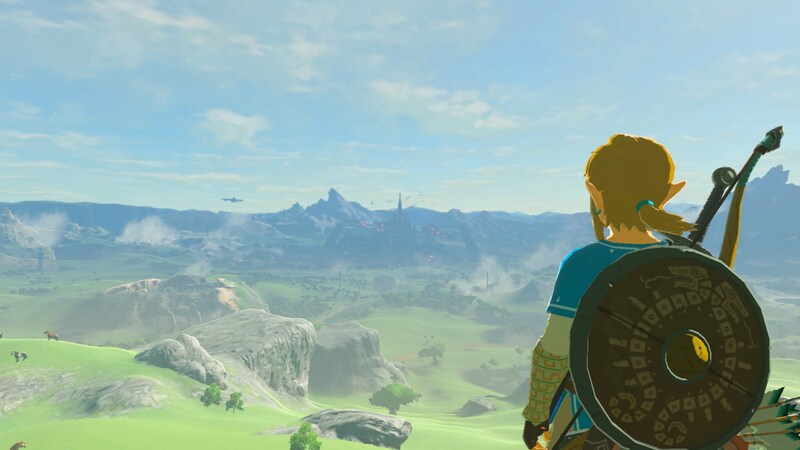 While open worlds are still a trend among gaming in 2017, few have been as interesting to explore — or fun in the process — as The Legend of Zelda: Breath of the Wild. For more information on The Legend of Zelda: Breath of the Wild, check out DualShockers’ review. 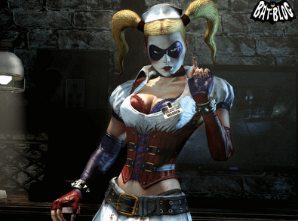 Developer NeatherRealm Studios is still the top dog for fighting games, and this can be seen in Injustice 2. Whereas other fighting titles tend to fall flat in some regard or another, Injustice 2 is the full package — offering deep gameplay, a well-told story, and a competitive scene that is entertaining to watch and be part of. For more informaiton on Injustice 2, you can check out the DualShockers review. 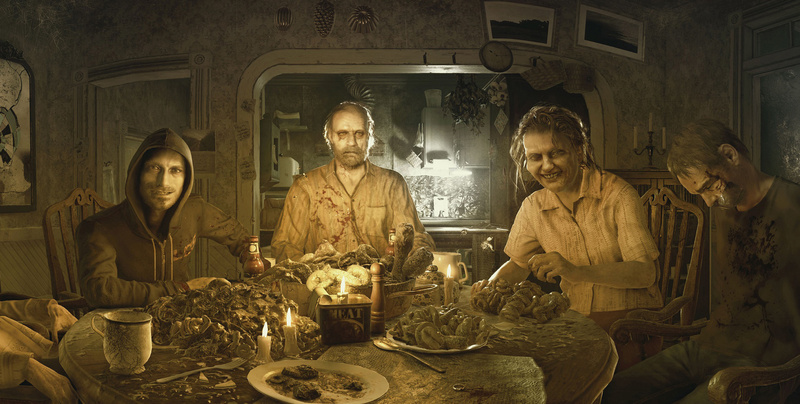 Resident Evil 7: biohazard was wowing audiences far before anyone knew it was a Resident Evil game and it was simply: The Kitchen. And whether you are a fan of the new first-person style of the series or not, it is hard to deny that Resident Evil 7 took the survival-horror genre by storm. Thanks to a return to real horror (versus the action-prone games in the series past) and satisfying combat, Resident Evil 7: biohazard easily sweeps the spot for top horror game of this year. On top of this award, Resident Evil 7: biohazard has also won Best Virtual Reality or Alternate Reality Game. For more information about the title, check out DualShockers’ review. Yes, we know. 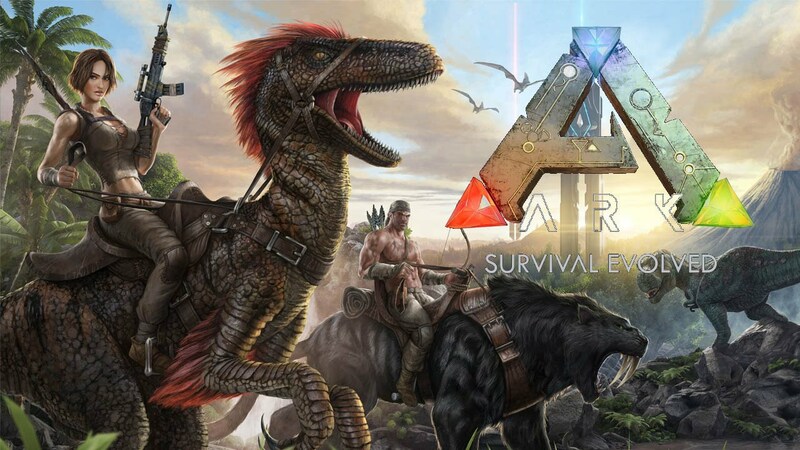 ARK: Survival Evolved has been around seemingly for ages. 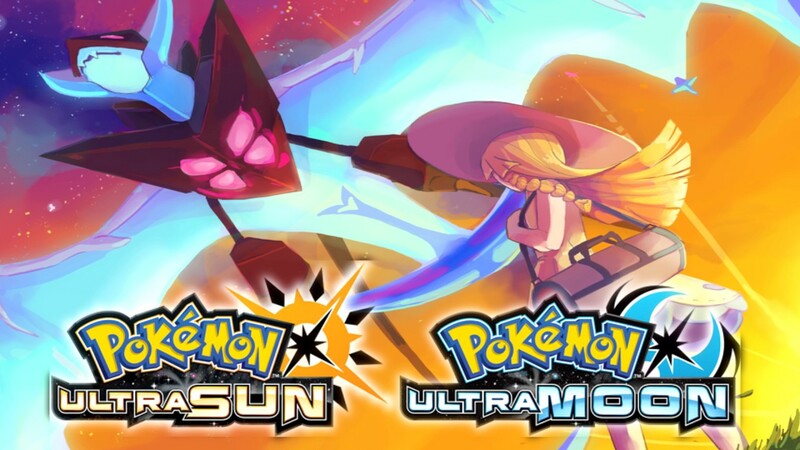 But from its Early Access release in 2015 to the official release earlier this year, it has been consistently surprising us with how many keep coming back to it. There have been a healthy amount of puzzle titles in the gaming scene this year, but none have wowed us with their simplicity and addictiveness so much as Puyo Puyo Tetris. While it isn’t unseating Tetris as the king of the series anytime soon, developer SEGA really outdid themselves with this match-up. 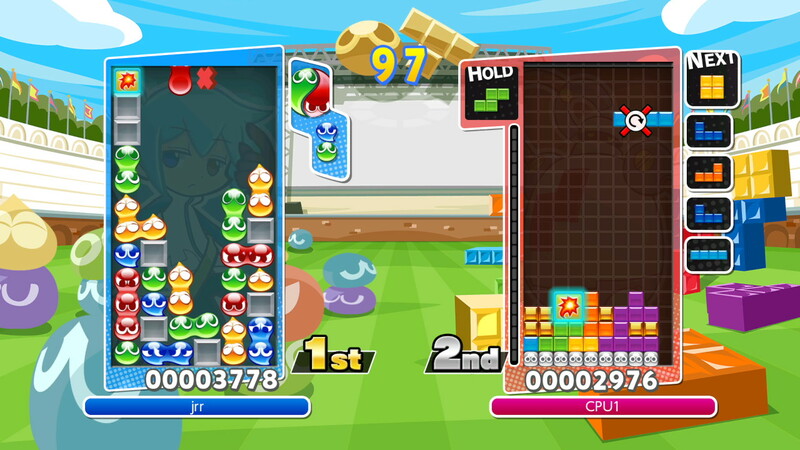 For more information on Puyo Puyo Tetris, you can check the DualShockers review. Say what you want, but Mario Kart 8 Deluxe has gotten the famed series down to a science. 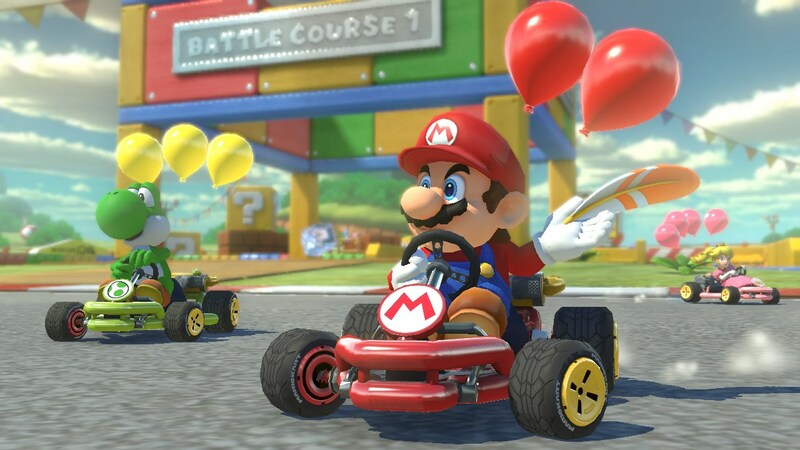 Both presenting what the Wii U added to the series, and also refining it by the addition of new modes and an auto-steer option for those picking it up for the first time, there is little not to like about Mario Kart 8 Deluxe. While it is not the most hyper-realistic racing game on the market, it is the one that we will continue picking up for years to come. For more information on Mario Kart 8 Deluxe, check out DualShockers’ review of the game. Wolfenstein II: The New Colossus had a lot to live up to. 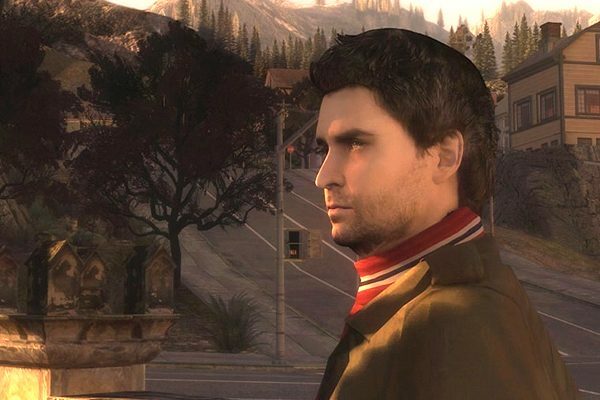 Even years later, the game’s predecessor is well-regarded as one of — if not the — best shooter for current generation consoles, thanks to a fleshed-out story and flawless game mechanics. Thankfully, Wolfenstein II didn’t let gamers down. While the gaming mechanics felt largely unchanged between the two games, the story and immersive world (Nazi-ravaged United States) added brand new depth to an already-amazing series. For more on Wolfenstein II: The New Colossus, check out the DualShockers reivew of it. Yes, Pyre is very much a sports game masquerading in an RPG’s clothes. And yes, those sports are excellent. While it is difficult to expertly pull off mechanics to an already-established game, it is another thing entirely to make up the rules and nuances of a game itself. 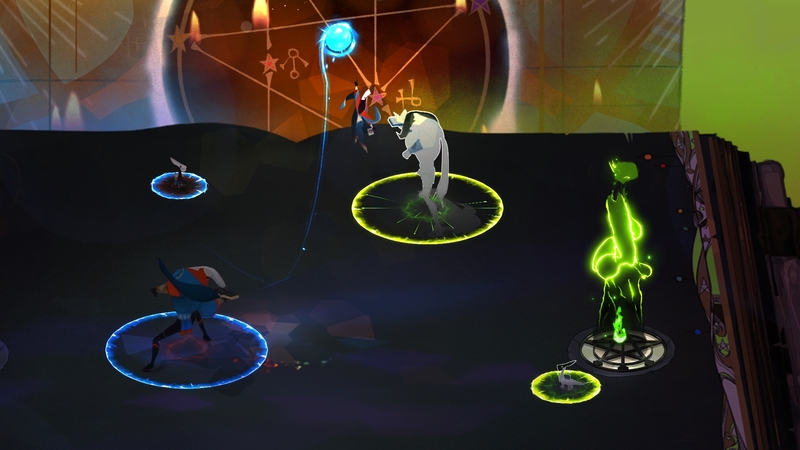 Not only that, by Pyre puts the effort into adding emotional depth, storytelling, and atmosphere in ways that other sports games simply can’t — or won’t — match. For more information, check out DualShockers’ review of Pyre. 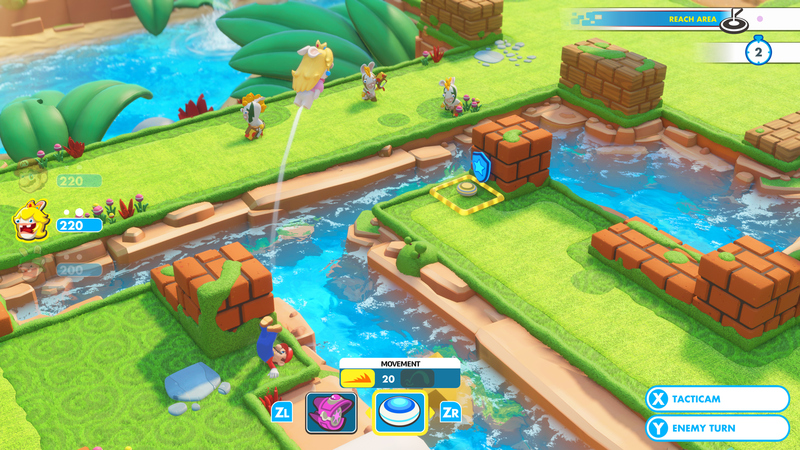 Picking up Mario + Rabbids Kingdom Battle, everyone had some healthy doubt in how a Ubisoft-branded Mario game would run. To our surprise, the answer was an enthusiastic “great.” While it may not have brought much to the stategy genre in the form of new ideas, it felt like an excellenty executed crossover that ran as well as some of the best in the genre. For more information on Mario + Rabbids Kingdom Battle, check out the DualShockers review. Often ignored when compared to some of the bigger AAA titles and gameplay-focused genres, simply storytelling in gaming is an art of its own. 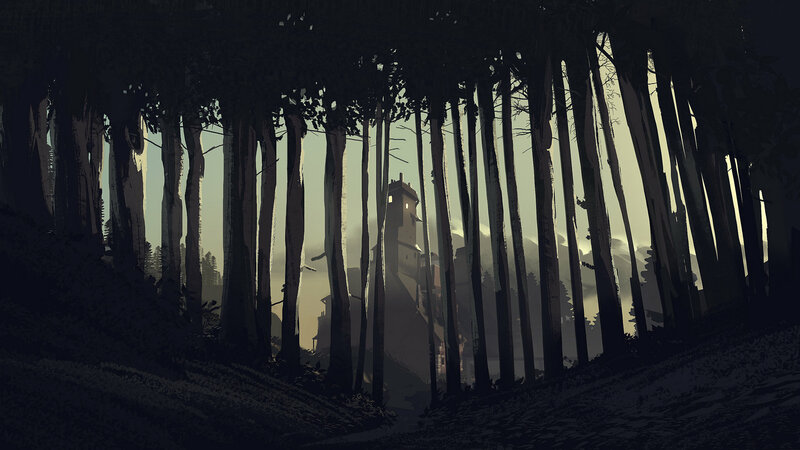 In that regard, What Remains of Edith Finch is a captivating — if not short — breakthrough in the genre, effortlessly advancing audio design, challenging norms, and redefining presentation of the first-person experience field. For more information on What Remains of Edith Finch, check out the DualShockers review. 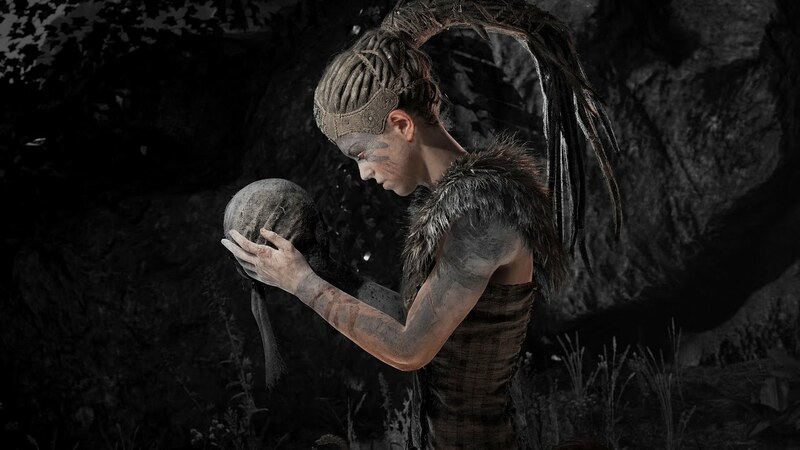 Few awards are as deserving as Hellblade: Senua’s Sacrifice winning best audio design. 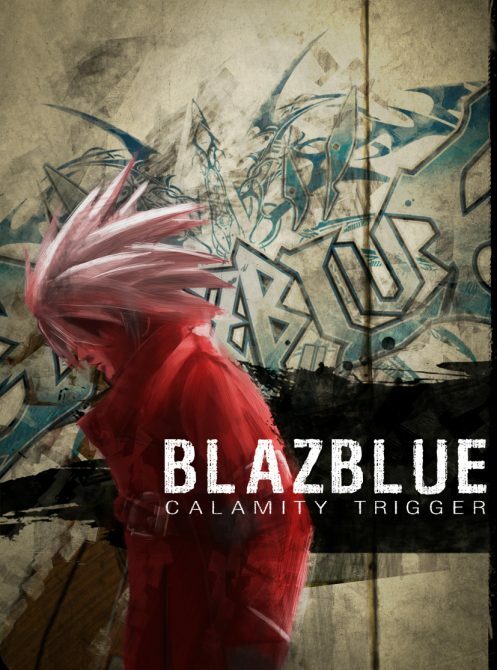 Developer Ninja Theory toyed, researched, and mastered the powerful concepts of neurosis and mental illness, portraying them in a realistic light through both audio design and on-screen images. In that sense, few games have offered the chills and frights that Hellblade does simply by whispering in your ear. 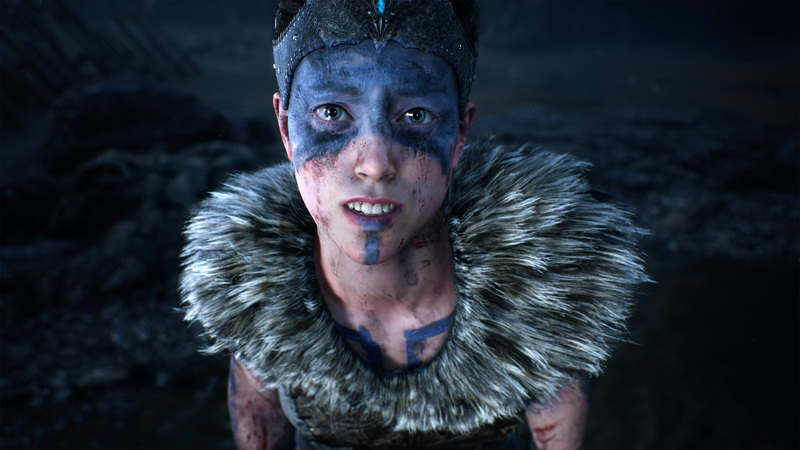 Along with this award, Hellblade: Senua’s Sacrifice takes the award for Most Intense Feels. For more information on the game, check out DualShockers’ review. 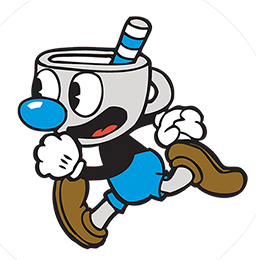 Not to be confused with the best waifu or husbando, Mugman surprisingly is our favorite character of 2017. 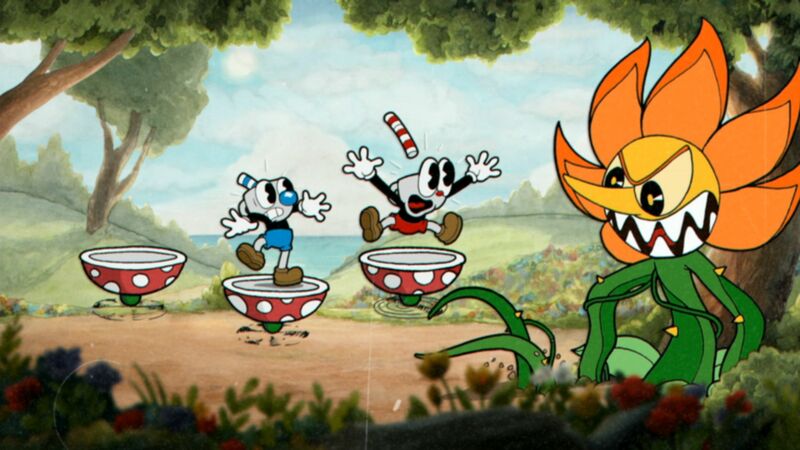 He may be living in the shadow of Cuphead, but his art direction is impeccable, he is fantastically animated, and we love how he takes a big gulp of his liquid courage right before every match. We’re right there with you, Mugman. There is a lot to love about Horizon: Zero Dawn, but their dedication to expansions may take the top slot. 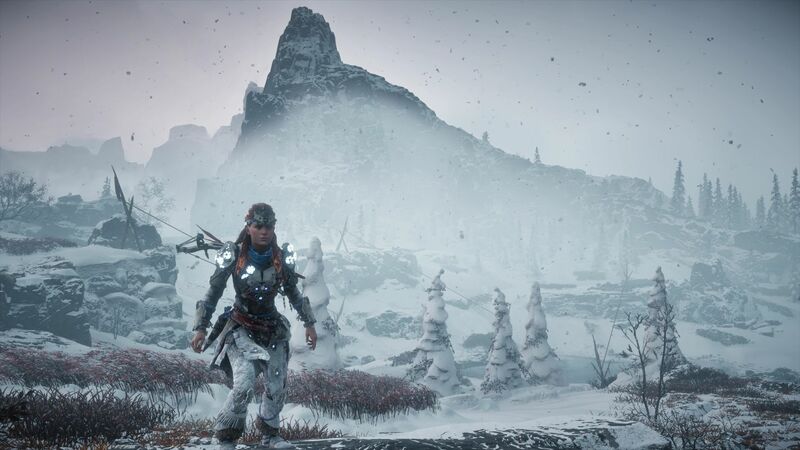 Whether it is how beautiful the new environments look on the PlayStation 4 Pro or how it broadens the gameplay of the already masterful base game, The Frozen Wilds is a masterclass in designing expansive downloadable content. Horizon: Zero Dawn also takes home the trophy for Best Graphics or Technology. You can check out more about the game by reading DualShockers’ review. 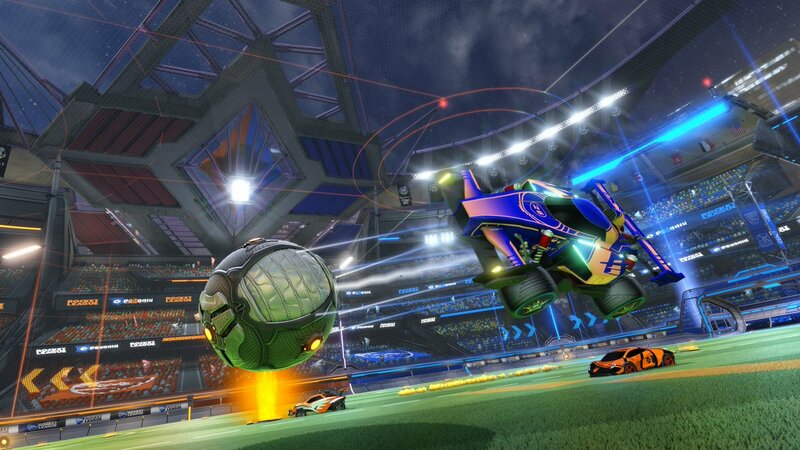 For nearly two years, Rocket League has been a mainstay in our software lineup. A masterful mashup of both nuanced gameplay and abject fun, Rocket League continues to dominate the online gaming market thanks to constant content drops and broadening out to new markets, namey the Nintendo Switch. Ashly Burch is no novice to the voice acting or gaming scene, with credits in Lifes is Strange: Before the Storm, World of Final Fantasy, Rise of the Tomb Raider, and Borderlands 2. 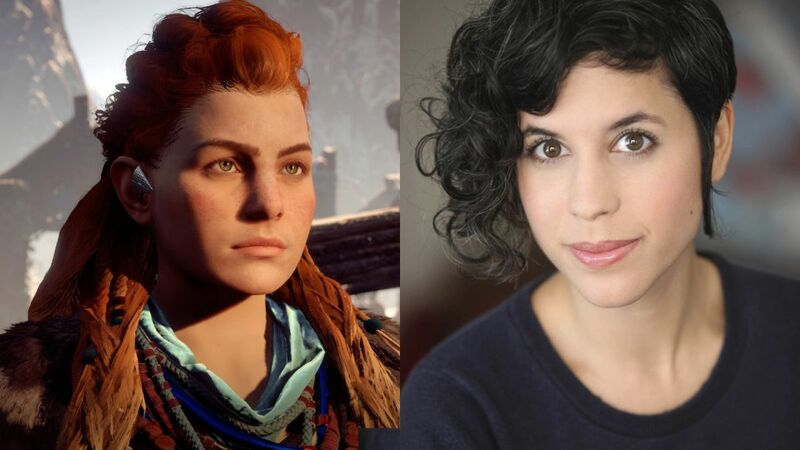 But her work as Aloy in Horizon: Zero Dawn may be her most impactful role to date, as she plays an inspiring heroine in the post-apocalyptic tribal landscape. A new category to our Game of the Year awards, Best Physical Package undeniably goes to the amazing effort put into the Persona 5 Take Your Heart Edition. 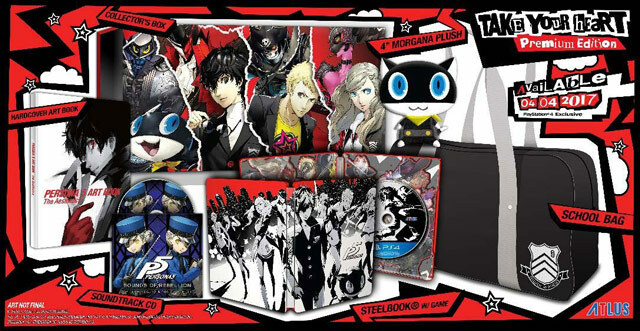 Not stopping at the simple “steelbook and soundtrack” inclusions that most collector’s editions include, the Take Your Heart Edition also came with a gorgeous box, hardcover art book, and the signature Shujin Academy school bag you see throughout the game. In a year chock full of remasters, Kingdom Hearts 2.8 HD: Final Chapter Prologue takes the top spot as the best remaster of the year. Introducing a host of new gamers to the previous Nintendo 3DS exclusive Kingdom Hearts Dream Drop Distance, the game also gave us the most solid foundational trip into what we can expect for Kingdom Hearts 3. 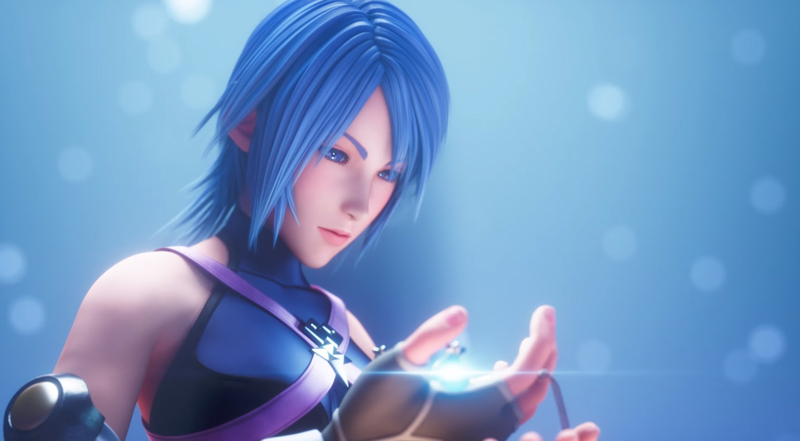 For more information on Kingdom Hearts 2.8 HD: Final Chapter Prologue, you can check out DualShockers’ review.